Explore Queensland's heartland towns of Longreach & Winton on a 5-7 day Outback Getaway. Witness a totally different way of schooling at Longreach School of Distance Education where you will walk in the footsteps of the students and teachers who share a classroom more than twice the size of Victoria! Wander the Qantas Founders Museum and step inside the 747 and 707 jets on a guided interpretive tour. Late afternoon, board the Longreach Explorer for the Drover’s Sunset Cruise on the Thomson River. Unwind with onboard nibbles and drinks, watching a magnificent outback sunset. Enjoy a two-course table service dinner under the stars as you watch the entertaining Smithy’s Outback Dinner and Show. Top off the evening with billy-tea and freshly baked damper. Join our Strathmore Station Smoko Tour* for an insider’s view into life on the land followed by a delicious morning tea. Explore the five themed galleries of the Australian Stockman’s Hall of Fame to discover the inspiring stories of the men, women and children living in and pioneering Outback Queensland. Late afternoon experience the warm hospitality of local graziers on our Camden Park Station Sunset Tour with Dinner. Be prepared to be impressed with the changing landscapes as we travel from Longreach to Winton. We visit the Australian Age of Dinosaurs perched high on a magnificent mesa overlooking the plains where dinosaurs once roamed! Onsite dinosaur enthusiasts treat us to a top-class interpretive tour of the laboratory, collection room and Dinosaur Canyon. In Winton see the quirky Arno’s Wall, the Musical Fence and learn the story behind Australia’s unofficial national anthem at the Waltzing Matilda Centre. Return to Longreach late afternoon. Dinner tonight will be at the award-winning Harry’s Restaurant. Guests on GET7 will arrive in Brisbane. + Fly/Rail Package: Flights and rail subject to availability & carriage conditions. Includes a one-way economy flight, of Outback Aussie Tours’ choosing, & one-way First Class overnight rail between Brisbane and Longreach. Rail price based on a one-way Aust. Govt. Senior Card Holder fares in a First Class sleeper on the Spirit of the Outback between Brisbane and Longreach. 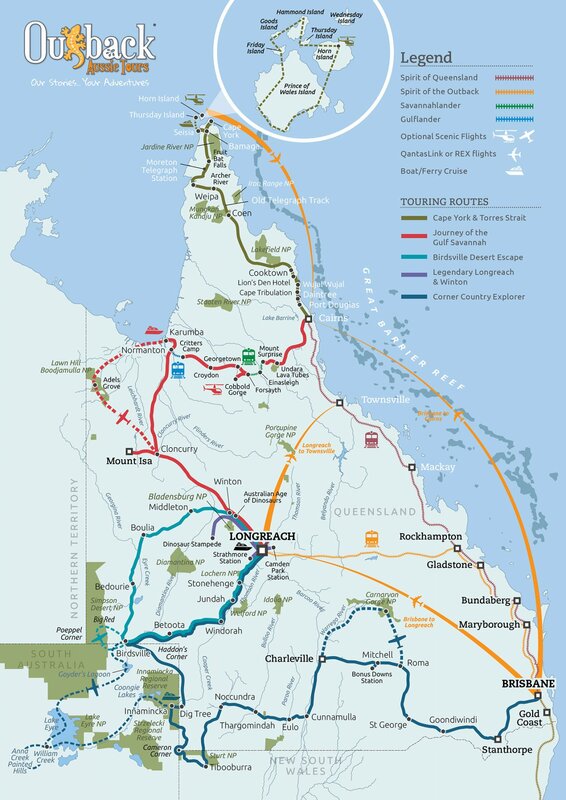 Please ask for Queensland Pensioner and Full Adult rail fares. * Return Rail Package: Rail subject to availability. Rail price based on return Aust. Govt. Senior Card Holder fares in a First Class sleeper on the Spirit of the Outback between Brisbane and Longreach. Please ask for Queensland Pensioner and Full Adult rail fares. # Return Rail Package: Rail subject to availability. Rail price based on return overnight First Class sleeper on the Spirit of the Outback between Brisbane and Longreach. Aust. Govt. Senior Card Holder Rail 4 Vouchers (Qld Rail Travel Shoulder Season Buy 1 Fare, get 2nd at a Companion Rate Deal. Valid on all twin fares, and single adult fares only). ^ Return Rail Package: Rail subject to availability. Rail price based on return overnight First Class sleeper on the Spirit of the Outback between Brisbane and Longreach. Aust. Govt. Senior Card Holder Rail 4 Vouchers (Qld Rail Travel Low Season 2FOR1 Deal – not valid on Single rate). Please ask for Queensland Pensioner and Full Adult rail fares. Return Fly Packages, and Tour only pricing ex Longreach are also available. The whole tour was great! From the moment we stepped off the plane and we had Wade to greet us everything went well. The four and half days going around Longreach and Winton was well organised with very friendly staff wherever we went. Apart from the boat trip and show (which were excellent) the other highlights were the Sunset Dinner at Camden Park Station and the tour and lunch at Rosebank Station. All food provided was of a high quality wherever we went and transport comfortable (even the 4 wheel drive Bus). I would definitely recommend this tour. The Best of The Outback! We have just had the best holiday of all time, every day there was something different and our guide was a fantastic, caring person that had a great knowledge of this great country he also possessed a great sense of fun, we flew to Brisbane from Sydney, travelled on the overnight train to longreach and had 4 nights there. We also met some lovely couples that we will keep in touch with. Brilliant! Thanks to the awesome Outback Aussie Tours team for a fantastic tour! Outback Aussie Tours were the perfect hosts and without them, my time in the Outback would not have been half as good. I loved every minute of my Outback experience. Particularly the Drovers Sunset Cruise - relaxing sunset cruise down the Thomson River with beautiful bird life, friendly turtles and amazing sunset colours; Smithy's Outback Dinner and Live Show - delicious, live music & love the setting; Camden Park Station - interesting station & Homestead tour followed by incredible sunset & delicious dinner at the fabulous "Outback Yacht Club"; Longreach School of Distance Education - fascinating, want to bring my children back here; Qantas Founders Museum - really interesting museum and Jets Tour; Australian Stockman's Hall of Fame - lots of intriguing history and loved the entertaining Outback Stockman's Show (what a great character & loved his animals too! ); Australian Age of Dinosaurs - loved the laboratory & collections room tours, and the sunset dinner was spectacular high up on the mesa; Lark Quarry - incredible to see & learn of what happened there millions of yrs ago. I could go on and on! Most of all, thanks Outback Aussie Tours for being so welcoming, friendly, knowledgeable, caring, interested, entertaining and such incredible hosts! I won't forget my absolutely fantastic time in the Outback for a very long time..
Just Great! We booked a getaway tour package with these guys and I can tell you, there is nothing you need to worry about. Longreach had, had several inch's of rain before we had arrived so much so that the train couldn't run but the folk at Aussie Outback tours did everything that they could do and more to make our trip special. These folk went the extra mile and more. We couldn't speak more highly of them. Thanks guys for the great adventure.